Government's spokesperson on infrastructure, Richard Asante Yeboah has come to the rescue of embattled Director-General of the Ghana Maritime Authority (GMA). According to him, the Director should be praised for reducing the huge costs the Authority used to pay as rent for accommodation. The Director, Kwame Owusu, defended the renovation of his “colonial style” 2-bedroom official Cantonments residence at the cost of GHc 1 million, despite concerns the amount was too high and smacks of corruption. Mr. Owusu even feels the upgraded residence is still relatively modest when compared to other ones occupied by other Director Generals of some state agencies and urged critics to think big. Speaking on Citi FM/Citi TV news analysis programme, The Big Issue on Saturday, Mr. Yeboah absolved the GMA boss of any wrongdoing. “I have also heard issues about him renovating a 2-bedroom house which costs the country Ghc 1 million. Over the years, the Director General of the Maritime Authority did not have a place of abode. So, as an institution, they were spending about $3000 to $4000 on the accommodation of their various Directors. This man comes in and says, there is no need for us to this. He goes to the Ministry of lands and asks for land to put up a facility. He had to pull down a wooden structure on the land he was given to reconstruct a four-bedroom house with other ancillary stuff to support the facility”. “This is a reconstruction of an entire structure. So, if someone sits somewhere and says that this is a renovation, when you actually pull down a whole structure and build a fresh one. I am into construction and I tell you; if you build a four-bedroom house with such facilities from scratch witch $120,000 in this country, I think that he has done the county a lot of good and a lot of savings. He must be commended for what he has done,” he maintained. It emerged that, following the renovation, the former wooden residence now has four bedrooms on the main structure, a living room, a dining room, kitchen, a family room, a library, and a basement. 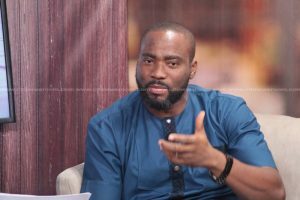 “Some Director Generals have a house allocated to them and have even a separate guest house for entertainment and if this Director General or any other Director General of the Ghana Maritime Authority who superintends over the maritime industry in Ghana cannot have a four bedroom or five bedrooms [home], then I say it is mediocrity in the mindset. We must think big,” the GMA boss stated. Mr. Owusu also has personal ties with the one who got the contract for the renovation, and he sees nothing wrong with that. He said due process was followed in awarding his “friend” the contract. He defiantly told the reporter asking questions on the matter that suggestions of conflict of interest were “below the belt” adding that, even if his wife could be awarded a contract with the authority if she was qualified for it.